You travel in Delhi Metro. To buy a token or to recharge your metro smart card, you have to wait in the queue. To help make travel hassle-free for passengers, Delhi Metro Rail Corporation (DMRC) is planning QR Code based payment at IGI Metro. Passengers will be able to pay for their ride through a QR Code on their smartphones. To do this, they’ll need to have Bharat Qr Code installed on their smartphone. The Union Government of India launched Bharat QR Code to promote cashless transactions across India. 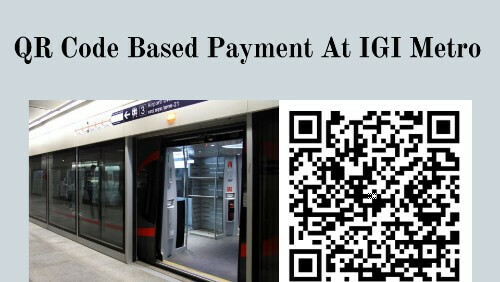 QR Code based payment at IGI Metro will help replace smart cards with smartphones at the Airport express line. There are chances that the system might roll out across Delhi Metro’s other lines too. There will be modification of AFC gates at all the stations that fall under Airport Express Line. This will enable AFC gates to accept QR Code based payments besides existing tokens and smart cards. Trials have already been conducted to implement the new service. Also see how India is using Bharat QR Code to make cashless transactions. AFC gates will have scanners to read the QR Code generated on passenger’s phone. This move will help save time as you’ll not need to stand in queues to get a token. Nor will you need to carry your plastic smart card. Hence, it will be beneficial to daily commuters.